When designing Active Directory Federation Services (AD FS) my actual involvement with the networking guys who handle the load balancer configuration is generally limited to a few calls and emails. We provide some requirements in the forms of availability and persistence or stickiness and they do what needs to be done. Truthfully, you get a high-level architectural view of the various solutions which helps with subsequent designs as you have a bit of experience of pitfalls from past engagements. This post is nothing prescriptive. I’m no expert with BigIP, Cisco or Brocade. But I do know AD FS and I do want to talk about a nuance that can change the basic persistence recommendations. AD FS. Generally you’ll have an internal (corpnet) Virtual IPv4 (VIP) for federation service (FS) servers and an external (Internet-facing) VIP for the Federation Service Proxy (FS-P). The VIP often supports both HTTP and HTTPS protocols, although most deployments are 95-100% HTTPS. The persistence or stickiness setting is generally NONE. AD FS is stateless and does not require client session affinity. The load balancer needs to do what it does to keep the TLS connection alive, but beyond that there is nothing application specific that requires affinity. MFA Server. This topology can vary a little, but I typically have two corpnet VIPs – one for the SDK WS, one for the user portal; and one external VIP for the user and mobile portals. These VIPs only really need to be HTTPS but I like to use both HTTP and HTTPS and redirect HTTP to HTTPS. These VIPs require session-based affinity, and generally we use source-IP. Let me draw what an AD FS IdP with MFA Server looks like to summarise the above. What am I trying to convey here? In my deployments there are too many FS servers to consider installing the MFA Server onto, so I always use the MFA Server secondary authentication provider, a.k.a. “AD FS Adapter”. This talks to the SDK WS, which is load balanced. The FS-P (WAP) talks to any AD FS server via the FS VIP. Payload is sent, response received and job done. 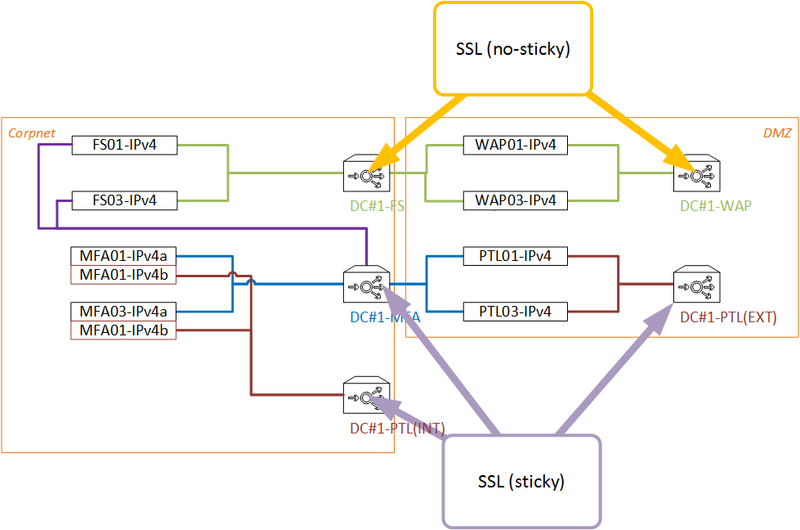 FS-P uses connection pooling and can and will talk to one of several FS servers and with round-robin distribution and no stickiness the FS can and will change. Now, when a user is authenticating from the Internet and is therefore interacting with the FS-P and MFA is invoked and the user’s chosen MFA mechanism is one-way SMS there can be a valid delay between the initial authentication with username and password and the OTP being entered. What we saw was that sometimes the FS-P would send the user-input OTP to a different FS than the one that the primary authentication happened with. This is not at all desirable. The FS that performed the primary authentication invoked the MFA and as such is the only server that can accept the OTP because only the MFA Server that initiated the OTP from the cloud service holds the OTP – the OTP is not written to the data file. When the FS-P uses a different connection to another FS the FS sends the OTP to a different MFA Server which rejects it because it has no knowledge of that OTP, so authentication fails. The solution is to turn on stickiness at the FS VIP so that the FS-P servers maintain connections with the same FS. The FS servers are already seeing consistent and persistent sessions with the MFA Server servers. Let me try and draw this just to be super clear. First, the blue arrow shows our on-premises federated user authenticate via FS-P (WAP01) which talks to FS01 which in turn talks to MFA01 which invokes one-way OTP. Secondly, the red arrow shows our user enter her OTP at WAP01 which communicates with FS03 which in turn communicates with MFA03 which has no knowledge of the OTP. 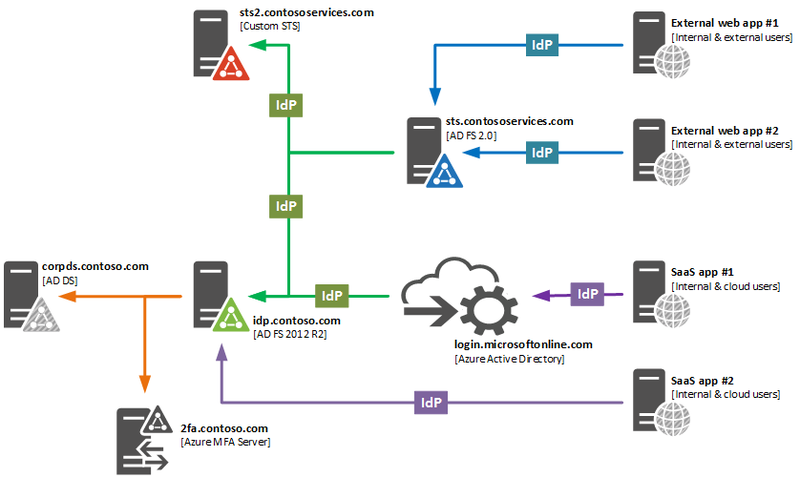 If you are using a deployment of AD FS 2012 R2 or AD FS 2016 and Azure MFA Server and the secondary authentication provider for MFA Server known as the AD FS adaptor and you allow one-way SMS as a means of authentication then you have to ensure SSL/TLS stickiness/affinity/persistence between FS-P (WAP) and FS (AD FS) in addition to stickiness on the MFA SDK web services VIP. 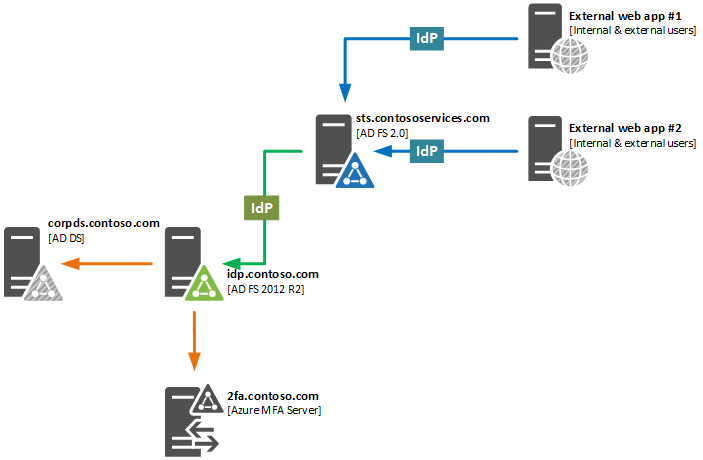 I first encountered this issue with a hybrid IdP (Azure AD Premium and AD FS as described above) with a significant user base (~100,000 active users across multiple geographies) and a medium to large number of federated applications (~100) during the post go-live phase of rolling out the MFA Server and Conditional Access Policies. Our concern at the time was that implementing stickiness on the FS VIP could result in multiple FS-P servers getting a sticky session to a single FS which would result in an uneven load distribution. We weren’t too bothered that the FS servers themselves couldn’t handle it – they can, we just didn’t want to see big spikes on a small set of the servers. Our concerns were unfounded. We had the luxury of Azure AD Connect Health giving us a rich set of easily digestible performance data and we monitored it closely when we made the change to the VIP and for a week or so after and we saw no ill effects. Hence the reason I’m happy to post this recommendation as I’ve since deployed another similar hybrid IdP and am now designing another and have to commit this recommendation to those designs. One of the primary reasons for doing so is to introduce persistent single sign-on (PSSO), which inevitably helps reduce MFA interaction for users and generally provides a simpler, more enriched user authentication experience across devices and on-premises and cloud-based applications. 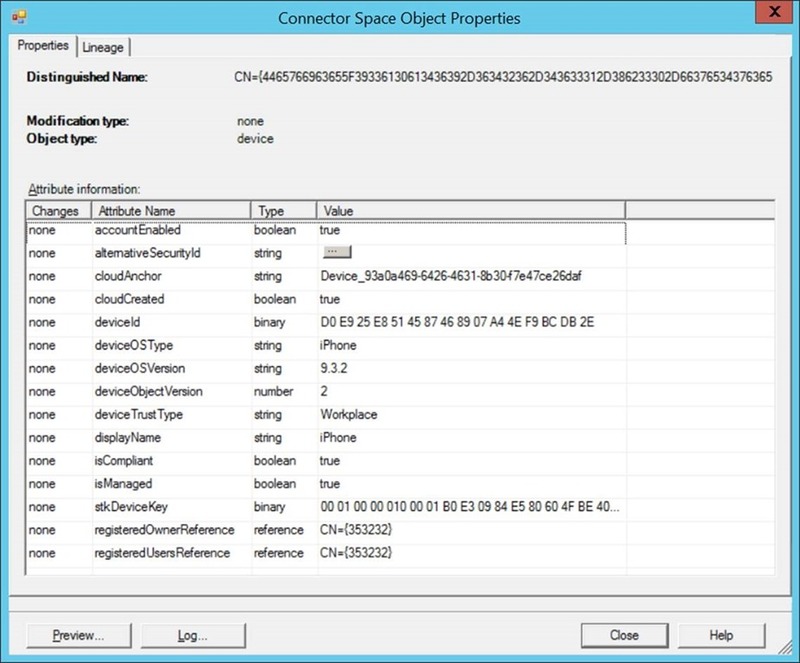 Write-back InTune managed devices and domain-joined, automatically registered devices. In other words, do not simply write-back any and all bring your own device (BYOD) devices, which is the default. The reason? AD FS issues persistent single sign-on cookies to registered devices, which reduces the amount of credential collection and MFA – a positive and beneficial configuration if you trust the device. Well, they don’t trust all devices, which is why they’re implementing InTune! The trust type will be one of three: Workplace; ServerAd; or AzureAd; and is depicted in https://manage.windowsazure.com as TRUST TYPE. A trust level of managed describes an automatically workplace-joined/registered device, i.e. Windows 7 or Windows 8.1 domain-joined machines. A trust level of compliant describes a device registered with and managed by InTune and currently in compliance with policy. A trust level of authenticated describes a device that has been registered via DRS and the user registering the device has successfully proven themselves, which typically means they authenticated with MFA. Windows 10 domain-joined machines are different to Windows 7 and Windows 8.1 devices. Whereas Win7 and Win8.1 have a trust level of managed, Windows 10 has authenticated. Windows 10 also does not have the isManaged Boolean set. Therefore, to identify managed and compliant devices, the following matrix is used. Here we can see an iPhone that has enrolled with InTune. The trust type is workplace and it is both compliant and managed. As we will see in the next section, this device will be written back to the on-premises AD DS and the owner of this device will get Persistent Single Sign-On when accessing AD FS and Azure AD applications. Out to AD – Device Join SOAInAAD. The out-of-box rule was copied and disabled. You apply configuration changes using PowerShell. The following script implements the changes described in the preceding section – it disables Microsoft.OuttoADDeviceJoinSOAInAAD.nnn and creates Customer.OuttoADDeviceJoinSOAInAAD.001 and Customer.InfromAADDeviceCommon.001. Customer.OuttoADDeviceJoinSOAInAAD.001 is a copy of the original OOB rule that is disabled that has a minor number of modifications. [String]$CustomRuleNamePrefix = 'Customer' # No spaces, e.g. 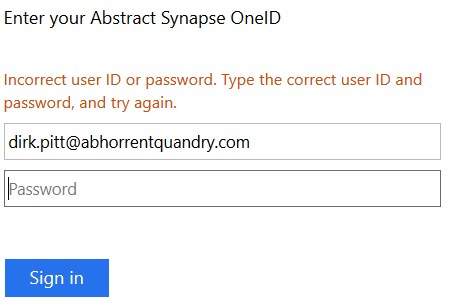 "Contoso" or "AbstractSynapse"
# Create custom "In from AAD Device Common rule"
Write-Host "Creating 'In from AAD Device Common' Sync Rule"
Write-Host "Creating 'Out to AD Device Join SOAInAAD' Sync Rule"
Write-Host "Disabling OOB sync rule Microsoft.OuttoADJoinSOAInAAD.001"
To apply, simply save and execute it on an AAD Connect server as a member of the ADSyncAdmins group. Once the configuration has been successfully applied you’ll need to execute a full synchronisation for all connectors. The end result is that you will have all devices registered in Azure DRS in the metaverse, and a subset of these devices written back to the CN=Registered Devices container in your on-premises AD DS forest. You can look see what is going to be provisioned versus what will remain filtered in the metaverse by looking at the cloudFiltered attribute of device objects. NULL means not filtered (and therefore will be provisioned) and TRUE means filtered. Azure Device Registration Service and InTune enrolment result in device objects registered in your Azure AD tenant and, optionally, written back to your on-premises Active Directory Domain Services forest by Azure AD Connect Sync. By default all registered devices are written back regardless of the state of that device. Some customers will not want all devices written back and will only want compliant devices or compliant devices and automatically-registered (domain-joined) devices written back. This post illustrates how to achieve this configuration by describing data available to understand differences in registered devices and a practical and working (and successfully deployed, I might add) approach to implementing the necessary filtering in Azure AD Connect. The result being more control over what devices are written back to on-premises and light-up persistent SSO. The example also handles the differences with Windows 10 AD DS domain-joined devices, which look different to Windows 7 and Windows 8.1 domain-joined devices. I don’t output to the screen, so to check that it’s worked, look for Sync Rules with an immutable tag starting with Customer or whatever you changed $CustomRuleNamePrefix to be and also ensure that the OOB SR with an immutable tag of Microsoft.OuttoADJoinSOAInAAD. * is disabled. 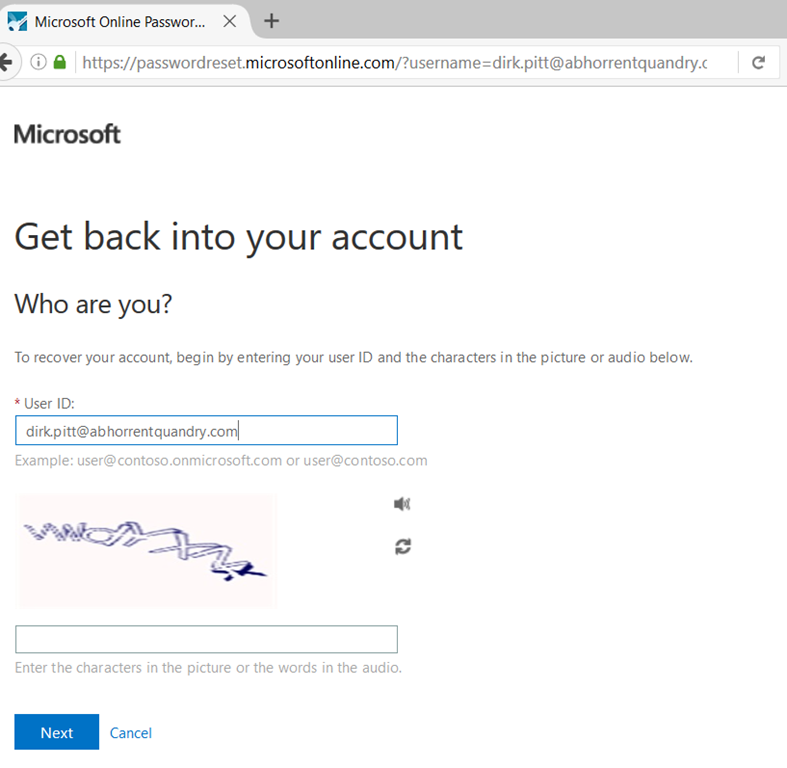 I won’t go over conditional access here – I have another post on that subject coming soon – and Ramiro does an awesome job of describing additional authentication rules in this post. Suffice to say, there’s a lot of flexibility when it comes to controlling MFA in AD FS 2012 R2 and AD FS 2016 when the application in question trusts your FS directly. The latter bullet is not really relevant here, but I am constantly coming across the first two points. Take the following architecture illustration as an example. What have I drawn? Four web or SaaS apps and three different identity providers all of which actually support your corporate users. Firstly, external web app #1 and #2 trust a specific federation service that has two claims provider trusts: one for a custom STS or FS that handles external users, hosted in a Linux LDAP directory; the other being your corporate IdP that handles corporate user authentications. Next, SaaS app #1 is an Azure AD pre-integrated app, i.e. it trusts AAD for authentication, however your Azure AD tenant contains both managed (cloud) and federated identities, where the federated identities are your on-premises corporate users and the cloud identities are non-IT staff, e.g. factory workers, that need access to at least one of your SaaS apps. Lastly, SaaS app #2 is a typical federated application that trusts your AD FS IdP. Here you get SSO to your SaaS apps using your on-premises identities, i.e. your Active Directory Domain Services (AD DS) users. Integrating MFA now just got a lot more complex (for a subset of your apps). I want to gloss over Azure AD because I have another post planned for a more detailed discussion around Conditional Access Policy, or CAP. So for AAD we’ll just say if you want MFA you need to control or configure that within Azure AD – this is Conditional Access Policy in AAD and it’s powerful, granular and the scope of what is included is growing. And as we discussed at the start of this post, the SaaS app that directly trusts AD FS is obvious and easy – that’s just additional authentication rules. User selects realm and is redirected to the corporate FS/IdP (the second FS – idp.contoso.com). All of this happens through java-script initiated browser redirects and HTTP POSTs. The request for a token to the first IdP from the second IdP (a request for a SAML token for sts.contososervices.com, issued by idp.contoso.com) has no information relating to the actual app the user is hitting. Only when the first IdP is issuing a token for the app is there any real information available about the app. When authenticating with the second FS the app is technically the first FS. So making a decision about whether to invoke MFA or not is not really the responsibility of the second – the corporate – FS. The corporate FS/IdP cannot accurately make the right decision as it is simply issuing a token for another IdP (although it’s just another relying party to the FS). What options exist then? Assuming that you don’t want to discuss the obvious answer which is implement MFA at the first FS. Note – I use the terms federation service (FS) and identity provider (IdP) interchangeably throughout this (and other) posts. As far as I am concerned they are synonymous. The application actually inspects the claims in the authentication token and determines whether or not MFA is needed, e.g. it looks to see if there’s an MFA authentication type value (http://schemas.microsoft.com/claims/multipleauthn) in the http://schemas.microsoft.com/claims/authnmethodsreferences claim type and perhaps also takes a look at the value of http://schemas.microsoft.com/ws/2012/01/insidecorporatenetwork claim type or maybe checks to see what role the authenticated user holds and, if the logic is such that you determine MFA is required, the app asks the IdP for MFA via the WAUTH (WS-Federation) or RequestedAuthNContext (SAML) request parameter. This is generally known as step-up authentication. In summary, your code looks for whether or not you have done MFA (you must issue the AuthNMethodsReferences claim to the app) and requests it if you have not and it feels it is needed. Again, Ramiro does a quality job of describing this with a .NET MVC example here. If the app simply requires MFA regardless of condition, then it can build the original sign-in request containing the WAUTH request parameter. You can find a nice succinct discussion on the topic in this TechNet wiki article. Beyond this you need to start venturing into the grey area of support that I like to think of as creative territory. Sure, it’s fun and you can make it work, but it’s unlikely to be an operationally sound option going forward. For example, you can look to rewrite the URL between the RP and the first FS and add the WAUTH query string, which the FS will honour. In one customer case I did a basic POC here, because the first FS was running AD FS 2.0 and therefore had IIS locally, so an HTTP Module simply added the WAUTH query string if it wasn’t there. You can also bake a “smart URL” where you craft the request yourself and again the FS will honour it, e.g. https://sts.contososervices.com/adfs/ls/?wa=wsignin1.0&wtrealm=urn:federation:dumpclaims&wauth=http://schemas.microsoft.com/claims/multipleauthn – users hitting this URL will undergo MFA and logon to the app, however you have to be sure that users will access the app via the URL. So, to answer the original question, upgrade sts.contososervices.com to AD FS 2016 and configure per-app MFA on each in-scope RP trust and make use of the above properties to get idp.contoso.com to perform the MFA. When I first created this blog several years back WordPress asked me for a catchy site title and a brief synopsis for the site tagline. I hadn’t really thought about this, so looked at the pre-filled strings and largely accepted them. WordPress, creates new blogs with the site title of “Yet another WordPress blog…”, so I, using enormous levels of creativity, replaced WordPress with identity management and moved on to focus on the brief synopsis that resulted in “thoughts and opinions on Microsoft identity management”. Groundbreaking imagination. At the time I was very busy implementing Forefront Identity Manager, or FIM, with multiple customers. With the usual bits and pieces that go with that. As time has moved on my role has naturally evolved, although I stubbornly retain my consultant or SME title and focus and refuse to “mature into an architect”. In other words I still roll up my sleeves and actually deliver! But the role has changed. The fundamental technology has changed that is. I used to fill the odd gap with AD FS work. Then I got real busy with some big AD FS projects and, in parallel, started doing a lot of the nasty, non-out-of-box Azure AD/Office 365 directory synchronisation projects, i.e. custom FIM-based DirSync solutions. This quietly evolved into Azure AD Premium and all things identity and scripting that wasn’t specifically Exchange Online or SharePoint Online. Now I find myself being one of the “identity guys”. You want to talk about Azure AD, AD FS, MFA, CAP, AAD Connect, App Proxy, DRS and the glue that no one wants to talk about – you need Paul. Which is very cool. And I really enjoy this stuff. And the next stage is likely more and more emphasis on understanding apps and clients and InTune. None of which should simply be called “identity management”. As I’m managing identities less and less, but building out or assisting and facilitating customers build out large and complex hybrid identity federation services infrastructures that light-up as much of the Azure AD stack as possible. So with that in mind I’m renaming my blog and tweaking my synopsis. Unfortunately, I still don’t really have much in terms of creativity, so the title is still quite bland. But at least it reflects what I am doing in my day job today, which is what drives the posts. Customer questions, problems I have to solve and mistakes my customers make or I make are the general inspiration, for want of a better term, behind my posts. Hopefully I won’t need to change this again any time soon. To understand Single Sign-On (SSO) and Persistent Single Sign-On (PSSO) in Active Directory Federation Services (AD FS) you must first understand the authentication cookie. After the initial logon is validated an authentication cookie is written to the client (typically a browser). These cookies are implementation-specific and opaque to intermediaries and the user, including the federation service proxy for example. Subsequent authentication is done using the cookie and does not necessitate recapturing credentials or re-authenticating via the original means, e.g. forms-based or Kerberos/NTLM. This is important. The cookie allows for subsequent authentication without recapturing credentials. In other words, the process is invisible or transparent to the user. The user is still authenticating, there’s still round trips back to the authentication service, but the user is not bothered – it’s seamless – it’s SSO. Within the AD FS authentication and token issuance flow the FS writes the authentication cookie to the client as a session cookie by default. The cookie contains a signed token and a set of claims in-line with the claims issued by the Active Directory Domain Services (AD DS) Claims Provider trust (or any other CP in the federated scenario). Session cookies are bound to the session. When the parent process, i.e. the browser, is terminated the session is destroyed. Thus, regardless of the validity of the token, you kill all instances of your browser, for example, and the token is destroyed. When a client requests a security token for a relying party (RP) from the FS the authentication cookie is used to authenticate to the FS and initialise or bootstrap the set of input claims for token issuance. This cookie provides SSO. An example being a client authenticates with AD FS and gets a token to an application, e.g. Azure AD, and then attempts to access another app, for example an on-premises federated app; the client already has a valid authentication token in the form of the cookie and therefore is able to SSO to the FS and obtain a new security token for the federated app. PSSO is basically an authentication cookie that persists across sessions. By default, authentication cookies are session-based, which means when the browser closes the cookie is destroyed. PSSO cookies are written to Workplace Joined (WPJ)/registered devices by default, i.e. devices that have registered using Azure Device Registration Services (DRS) and been written back to the on-premises Active Directory Domain Services (AD DS) forest by Azure AD Connect (hybrid model); or registered directly using Windows Server 2012 R2 Device Registration Service (on-premises model). AD FS will also set PSSO cookies if Keep Me Signed In (KMSI) is selected during the authentication process. All of the above are global settings, read using Get-AdfsProperties and managed using Set-AdfsProperties. What about the actual tokens issued? The RP settings are read using Get-AdfsRelyingPartyTrust and managed using Set-AdfsRelyingPartyTrust. The default value, when read, is zero, which actually means 60, as the property expects the configured value in minutes. If you authenticate using IWA then the re-authentication (credential capture) is invisible – it’s SSO – so you won’t see much from a UX perspective, but you’ll have a fresh and valid 60-minute token. Always Require Authentication is particularly useful if you require Multi-Factor Authentication (MFA) for a sensitive app. Regardless of SSO/PSSO state, if you mandate MFA and Always Require Authentication for an RP then each time you need a token for that app you will MFA. I’ll describe the information here for posterity purposes. Non-registered devices. For non-registered devices SSO and PSSO is managed using KMSI settings, as is true of AD FS 2012 R2. If KMSI is disabled the SSO cookie has an 8-hour validity (SsoLifetime property of the RP trust). AD FS 2012 R2 and AD FS 2016 tokens have a one hour (sixty minute) validity period by default. This value is configurable on a per-relying party trust basis. Token issuance requires that the token requestor has been authenticated by AD FS and has authorisation to request a token. When a user is authenticated by AD FS an authentication cookie is written to the client to provide an SSO period, and subsequent requests to AD FS utilise this SSO period (authentication cookie). The default value for the SSO period is 8 hours and is configurable at the global AD FS level. If Keep Me Signed In is enabled and selected by the requestor, the SSO lifetime increases to 24 hours by default. This value is configurable, globally, up to a maximum of 7 days. If the requestor is authenticating from a registered device the SSO lifetime increases to 7 days in AD FS 2012 R2 and 90 days in AD FS 2016. The 90 day validity requires an authentication within a 14 day period known as the device usage window, which means if you don’t access an AD FS application for more than 14 days then credentials will need to be recaptured, i.e. the SSO cookie is invalidated. Lastly, you can configure a property of an RP trust to force authentication every time a token is requested. That is, by enabling Always Require Authentication you configure AD FS to ignore SSO cookies for the configured trust(s). This is useful when you want to deploy and utilise PSSO but need to mandate MFA for high-value assets. 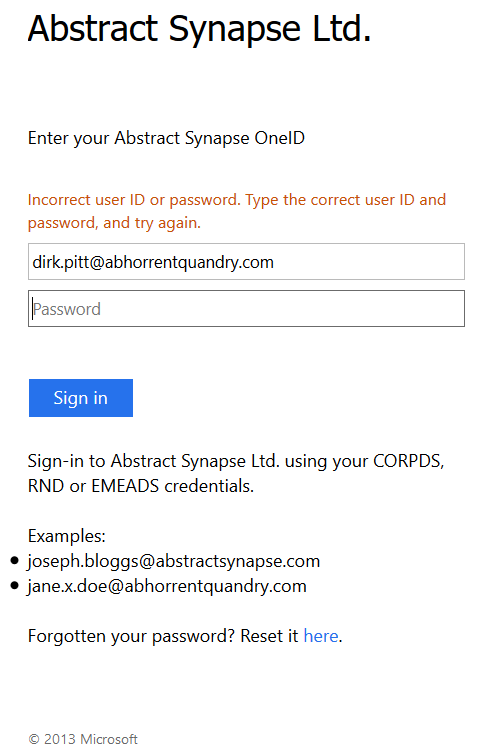 Implementing Azure Active Directory Password Reset? Want to make it a bit easier for your users who logon to Azure AD using federated identities to get to the self-service password reset and/or unlock portal? Take the following customised forms-based authentication (FBA) sign-in page in Active Directory Federation Services (AD FS) 2012 R2, a.k.a. “AD FS 3.0” – typically accessed by users outside of the corporate network, hitting the FS-P (Web Application Proxy, WAP) but also by corpnet users with devices that are not capable of performing Integrated Windows Authentication (IWA, sometimes referred to as WIA). A requirement that has cropped up, for me at least, a few times is to allow users to navigate to the password reset workflow from here – particularly those customers that have enabled the ~updatepassword endpoint that allows for the neat in-line password change experience. The result of this requirement is therefore something like this – the FBA sign-in page after a bad password is entered. The above code snippet has a dependency on a var called userNamePlaceHolder. You can remove this check or you can implement the placeholder customisation with the following block of additional JS. 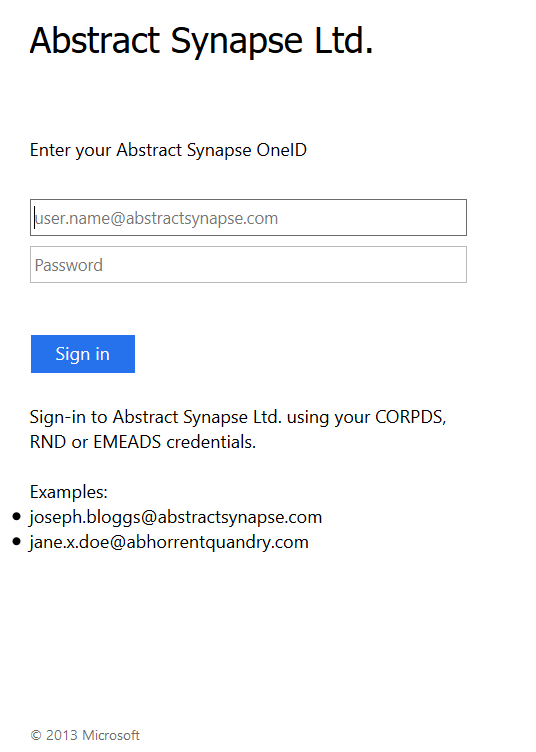 What the above is doing is replacing the out-of-box someone@example.com with user.name@abstractsynapse.com.